There is no stopping when it comes to the world of technology, it is fast pace and already fleeting that even many of the smartphones are not yet explored by us but the newer ones are replacing them and earning themselves some great market value. The consumers want something striking, they like new features and to some degree something which their previous handsets do not have. Apple or Samsung keep on experimenting with not only the body, layout, shape, size, colors & the features, they try to be the top-notch and be the most reliable of all times so people would blindly trust them and buy their devices without having any second thoughts. Apple iPhone 7 and 7 Plus have recent been launched with a bang, although they are a little costly and for some of us –it is still out of hand; we can hope that the prices fall a little low so we could afford it too. Of course when there is quality, you will pay the price for it, when there is excellence, reliability and a former good repute; people will not think twice and grab the phone for themselves. 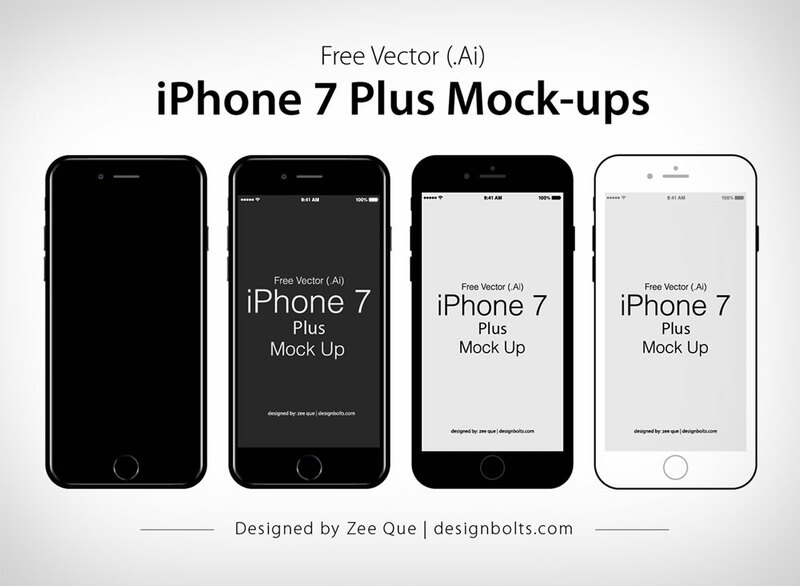 Now here I am providing you free vector flat & official Apple iPhone 7 Plus ai mock-up. So if you have developed iPhone apps you can insert in your application design that how it is going to look in real form (in iPhone 7 plus) and it is ready for the presentation. Also you can use this Vector in posters or banners, depends on how you want to use them. The colors of Apple iPhone 7/ 7 Plus are bedazzling, I personally love the jet black one, and it looks hot nevertheless with the sleekness and depth! What is your personal experience with the new iPhone 7 plus? Do you think it is handy to carry it around? Stay hooked and we will keep highlighting more trendy stuff for you all. Subscribe us for more posts in future as well. Here we go!